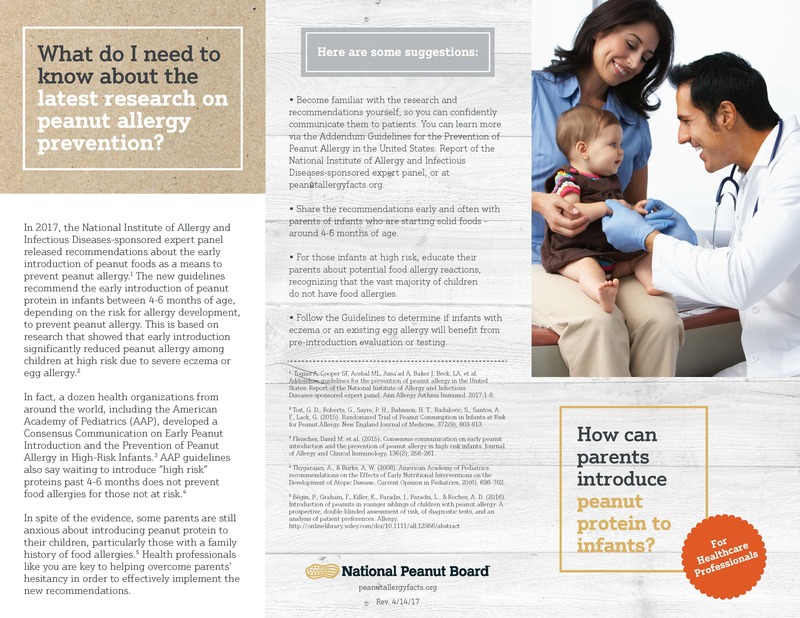 Health professionals like you are key to helping overcome parents’ hesitancy in order to effectively implement the new recommendations for early introduction of peanut foods. Dr. JJ Levenstein shares latest recommendation on the benefits of eating peanuts during pregnancy. In 2017, a National Institute of Allergy and Infectious Diseases-sponsored expert panel released recommendations about the early introduction of peanut foods as a means to prevent peanut allergy.1 In spite of the evidence, some parents are still anxious about introducing peanut protein to their children, particularly those with a family history of food allergies.2 Health professionals like you are key to helping overcome parents’ hesitancy in order to effectively implement the new recommendations. Proper diagnosis and management of food allergies are critical. The Academy of Nutrition Dietetics offers online training in food allergy and how you can help your clients manage theirs. 1.Togias A, Cooper SF, Acebal ML, Assa’ad A, Baker J, Beck, LA, et al. Addendum guidelines for the prevention of peanut allergy in the United States: Report of the National Institute of Allergy and Infectious Diseases-sponsored expert panel. Ann Allergy Asthma Immunol. 2017:1-8.